Please help me with my new bathroom! I am redoing a family bathroom on a tight budget and could really do with some help! 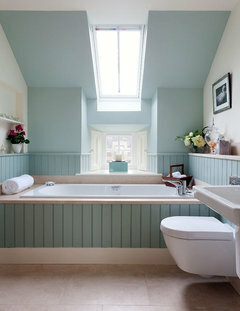 The layout is just like this bathroom below, with the bath under the sash window, loo to the right and basin facing it. The corner shower unit will be next to the loo as you come in and the door is opposite the window. There is room to the right of the bath (approx 30cm) which I'd like to box out, to contain the soil pipe, which will run under, and to give storage on top. What I am struggling with is what surface to use around the bath - I don't have the budget for stone or marble and I don't think tiles would look so good. I'm also unsure whether to box in the soil pipe at low level or run the boxing in at a higher level and fit a hidden cistern in it. Any ideas would be very welcome. Thanks! 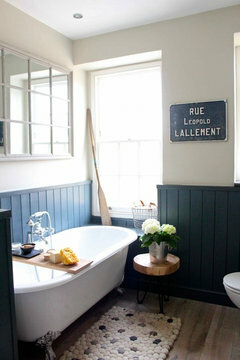 Should add that the photo is most definitely NOT my bathroom but how I would like it to look style wise!! Two new bathroom designs, help please! Everyone, thank you so much, this has been really useful! A few responses: 1) I'd intended putting open shelves to the right of the ensuite shower. 2) The bathroom designer put the main bathroom sink in the alcove like some of you... 3) I don't want a bidet, sorry! 4) The main view of bathroom is from left as that is the top of the stairs. 5) Not sure about curved bath, need to fit two toddlers in! Will think about bath next to window though as it would give more space to kneel washing said toddlers. 6) The ensuite currently has sink under window and toilet to right but hard to access cupboards where I have put open shelving. Apart from that it works well so not sure about messing with something that works! Thanks again, will talk over with hubby! Thank you so much everyone for taking the time to comment. It's really tricky taking good photos as the space is so tight, but I will attach another photo and sketch to give a better idea of the space. Daisy- the photo was stretched, I didn't realise my portrait photo would be converted to landscape. So the sink is just set into a 50cm wide unit. I think the idea of moving the sink to the current bidet position is a good one, although as you'll see from the sketch there's very little wall on the left of the window so not much space for a mirror in front of the sink. Carolina- I love that photo! The bit I can't quite get is how the shower door would work if the shower head remained on the right (all the shower controls/electrics are on the other side of the wall, taking up space in a wardrobe!!) and the sink was on the left. whizzywig- the door opens out (my sketch should show it now) and the photo was taken from outside the door. I think the distance you asked for is 74cm. And yes, we queried the plumbing for a wc when we bought the house, but unfortunately it's not there - they said they didn't like the idea of a loo near their bed!!! I could do a pic but it is all changing so not sure it would help. I could do a rough plan? 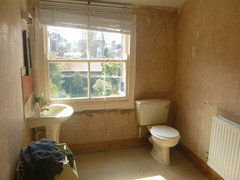 It will look like the first photo, with bath under window, basin on left and loo on right. Picture, even work in progress would give an idea. Ok, here goes. Bath will go under the window, loo will be turned side on, opposite the basin which will be as it is now but nearer the door, if that makes sense? Hi. I see what you mean re the tiles and bath now. How much gap is there between the bath and window? Could you not box out the bath wall to wall or is that what you meant? Re the cistern, is the radiator moving? Thanks minnie, yes radiator is moving. I like both those pics and am dithering about the things you bring up. Firstly if I should move the bath away from the window so it isnt sitting right underneath and box out there and also about concealing the cistern. For the cistern I cant decide whether to go for similar to your first pic or your second. Re boxing out the whole wall I don't think this would work as the shower unit will go on that wall, also I'd like to use the boxing surface as storage for toiletries etc. But its a good idea! I did wonder, it could look good though and would centralise the window. I didn't go for that option as I did it in my last house and you just knocked your head every time you went to pick something up or clean it. Maybe mine wasn't high enough though! Yes the window is not centre, the left wall which is now angled (you can just see it in the second photo) was moved to accommodate the door. If the room and budget were bigger I'd bring in the right hand wall or reinstate the original wall on the left but sadly neither is the case! Re boxing in the pipes, if I leave walls as they are do you think low boxing and standard loo as per your first pic or higher level to with concealed cistern would look better? Budget is always a problem! I think I'm erring towards the first pic, reason being is that I don't know how much space you have between the loo and shower. If it's too close I think it may look odd. I do also like the stepped one you posted if you take it from the end of the bath as they have done. The wall is 3m long so not too cramped. The shower unit is 900mm quadrant, bath size is undecided but hopefully 800mm width. I probably have to live with the bath being butted up right next to the window as I'm not sure there is room to build it out. That shouldn't be too bad re space, it's not a tiny bathroom. I wouldn't worry about the bath against the wall, they look good under windows. 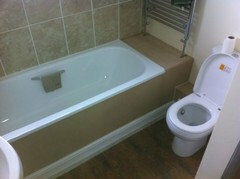 So what will you do re tiling or alternative around the bath? Yes you're right, baths are often under a window. Not sure re tiles etc around the bath. Am having metro tiles so not sure how they would look laid flat. I am erring towards your option 1 photo and a standard loo, but I cant see what they have covered the boxing in surface with. And thank you for all your advice!! I don't know what gap you've got between the window and bath for tiling. It does look like board doesn't it?! I'm struggling to think of a material that could be used other than tiles or t&g which isn't going to cost a fortune. I've attached this pic from Kate's creative space for t&g ideas ie you could take it under the window and round but then maybe a solid bath panel? Thanks that does look nice. I have two young kids though so I think I need to tile around the bath! I think I have changed my mind and am going for higher boxing in with concealed cistern, partly as this will make the window look less off centre. That way I can tile around bath but have a shelf for storage and to hide the cistern. But with tiles rather than t&g up to the shelf! Yes, not great with kids then! That looks good. If you're using the metro tiles maybe consider a different colour for the shower as contrast? That's a nice idea. It will either be white tiles and dark grey walls or grey tiles with pale walls, not sure which yet! What colour are you having with the grey metro tiles you are using in your rental bathroom? What are you doing with the floor? Our walls will just be white. I may put add some artwork on a wall though as we're using an absolute minimum amount of tiles to cut costs so it may look a bit bland all white. The plumber, who we've used a few times, wouldn't let me go with anything else as its being rented so I couldn't move the loo or change bath design etc! It does make sense though. I think I will go for decent quality vinyl or real lino as its a chipboard floor under the current vinyl. I find that easy to clean and warm underfoot, I don't like tiles as they are cold and hard. That makes absolute sense. We're going vinyl but cheap and it needs to be boarded but a friend is doing that. If it rips we can then replace really cheaply. Yes, a mirror is a must as the window is quite small with obscured glass. 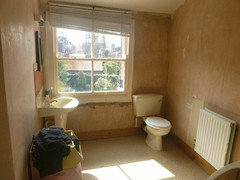 We only moved last year but the en suite didn't appear to have ever been used. It's nice but with porcelain tiles that are a nightmare to keep clean. We got lucky with the bathroom. Fittings are quite old but it's wood panelled all round with a cast iron bath and a couple of sash windows. It did have yellow walls and a dark green bath but I painted the bath black with elephants breath on the panelled walls. I'm going to repaint the walls though as it's not a real wow and it could be. I'm just working up to it though as painting wood panels is not an easy task! That sounds good, nice and classic colours, I love Elephants Breath, its a great colour and looks lovely with white or black. The bathroom looks simple,neat and lovely! If you have enough space to put the solid surface tub in it, it would be better than now. How can I update the front of the house?